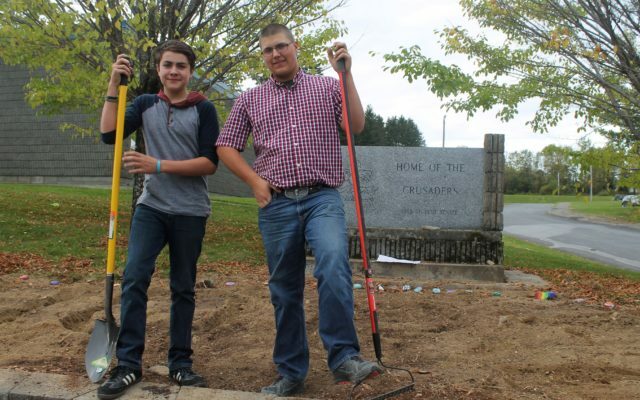 VAN BUREN, Maine — Eighth-grade students Jacob Burgess and Erik Rossignol said they learned some very important things when Julia Hansen, founder of The Yellow Tulip Project spoke at Van Buren District Secondary School on Wednesday, Oct. 4. “I learned that it helps to speak out about depression. 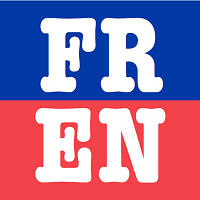 It’s not something you should keep hidden and bottled up inside,” Rossignol said. “If you need help you can get help. Talk to people,” Burgess added. Hansen was a sophomore at Waynflete School in Portland when she launched The Yellow Tulip Project in 2016 after two of her closest friends took their own lives. On Wednesday, she spoke of the tragedy of suicide and told Van Buren students and members of the community about the importance of reaching out for help. According to the Maine Suicide Prevention Program, suicide claims the lives of more than 200 Mainers every year. In 2016, Van Buren student Austin West died by suicide when he was just 15-years-old. “I felt shocked. I was surprised that he was depressed and he would go that far,” Rossignol said. “You can never really tell when someone is depressed,” Burgess added. 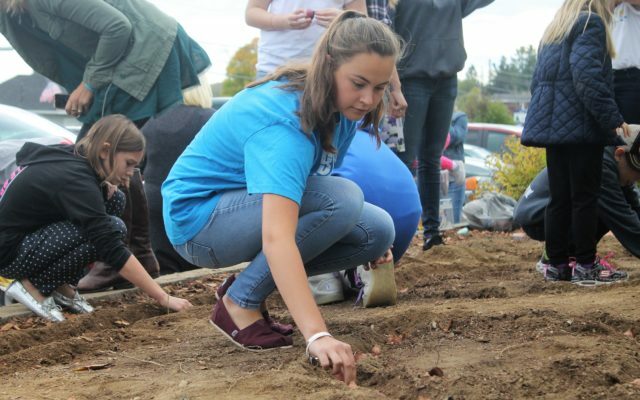 Arianna Berry helps plant a Hope Garden at Van Buren District Secondary School on Wednesday, Oct. 4. The Yellow Tulip Project aims to eliminate the stigma associated with mental illness and to help prevent suicides. 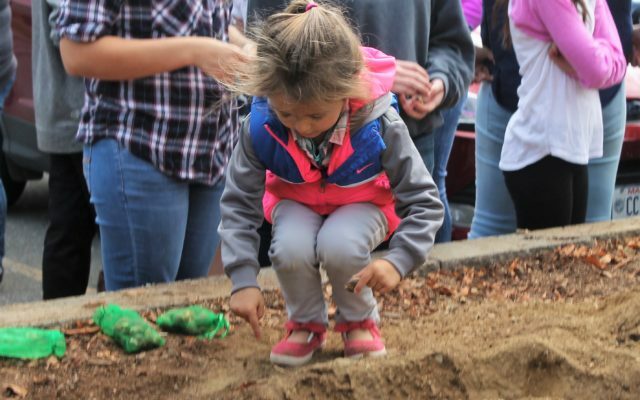 One way communities can help this effort is by planting tulips and other flowers in a Hope Garden, which Van Buren students did following Hansen’s presentation. “Hope Gardens bring a community together to collectively smash the stigma associated with mental illness. After a long winter, tulips remind us of perseverance and the renewal of spring,” according to the Yellow Tulip Project website. Community members gathered in August to prepare a garden bed at the front of the school for planting. 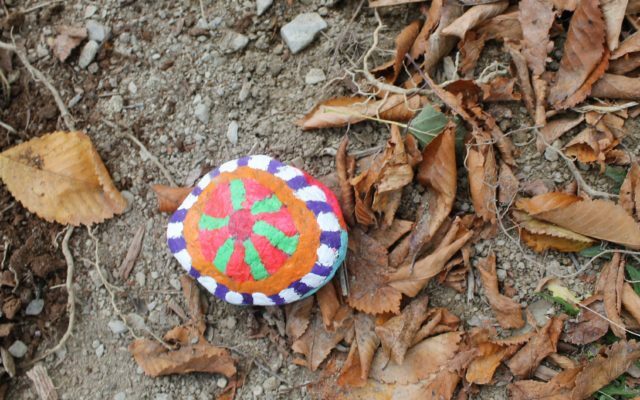 Middle-school students each also painted individual rocks to decorate the garden. “The flowers are gonna bloom into hope,” Rossignol said. Hansen said she is glad she drove five hours from downstate to share her message of hope with the Van Buren students. For more information about The Yellow Tulip Project visit online: http://www.theyellowtulipproject.org.